Tell us a little bit about yourself. How did you enter the reefing world? I started my first reef aquarium in April of 1997 after an ice storm in the north eastern USA took out the electrical power for over a week. It got so cold in the house my family had to leave. I was a freshwater African Cichlid keeper at the time. I covered the tanks with as many blankets and towels as I could find to attempt to keep them warm before I left. When power returned I found out I had lost nearly everything from adult to fry tanks. Knowing I would have to start over from scratch and from the encouragement of others I decided to follow my dreams of starting a full reef tank. Apparently I gawked at the marine fish and corals every time I went to the aquarium store. Like many newbies at the time, I started with a pair of Percula clownfish, a random anemone and some overpriced mushrooms corals. Shorted after that I heeded some of the best advice – get some good books and read and educate yourself on what I was attempting to do. The recently released The Reef Aquarium Volume 1 by J. Charles Delbeek and Julian Sprung changed my life with reef aquarium husbandry. (I progressed enough in this wonderful hobby that I’m mentioned in Volume Three). The clownfish thrived for many years. One of my most cherished memories in this hobby is of my young daughter, just a toddler at the time sitting in my lap as we both watched the clownfish dance and spawn while laying eggs in little circles on the glass. One of the original clownfish I kept for 8 years before it died. The other I had for over 10 years before having to give it away when I took the tank down while moving to a new house. The anemone thrived for 8 years with multiple documented spawning events. However it perished during a different tank move to a new house. The mushrooms were indestructible and I gave away every rock that had a trace of a mushroom coral before attempting to move onto stony corals. That was pretty much every rock in the tank. It was the 180 gallon Oceanic brand tank I was setting up for stony corals and clams that had these new (to me) things called “overflows” and a “sump” setup. 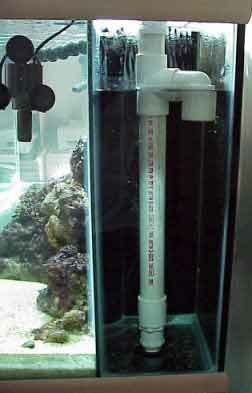 The standard configuration for an overflow at the time was a tall perforated plastic pipes wrapped in a sponge filter. As the sponge filter clogged the water level would slowly creep upwards until the sponges were removed and cleaned. The moment I fired up the return pump and water started falling into the 24 inch tall overflows … wow, I knew this was not going to end well. It sounded like the loudest possible toilet bowl flushing 24 hours a day that could be heard across the house! Why would anyone want something like this? That night was horrible and my wife reminded me every few minutes. The internet was pretty new, reef websites and forums did not exist yet. However, there were mailing lists you could subscribe to and ask questions via email. I started there. The big question: how did the Durso Overflow idea occur to you? Enjoy it. This is the sound of advanced aquarium keeping. This was still not acceptable. My reef aquarium was in my dining room and we still could not talk over the sounds coming from the overflow chambers. I pressed on for some other ideas. A fellow by the name Mark Lanett responded to me about using a solid pipe instead of the perforated pipe provided by the manufacture and keep the intake submerged. I had a pile of PVC parts left over from the sump plumbing and I got to work playing with them. Just inserting the solid pipe which reduced the distance water was falling made a decent difference in sound. Then I tried to figure out how to keep the intake submerged. I started with the PVC Tee fitting alone. This again helped as water now entered from the side and the intake was partly submerged. It appeared that this helped reduce the noise by interrupting the toilet bowl swirling water down the drain which symptom which created the gurgling sound. The elbow pointing downwards was added to improve on this. Within seconds it was obvious this was going to be a big improvement. Sound was still coming from the open top of the Tee exposed to the air. When I put my hand over the opening it went nearly silent. So naturally I tried an end-cap which made it completely silent until a full-siphon kicked in which dropped the water level to the opening of the elbow and it sucked and slurped air again. It need a little bit of air to prevent a full siphon from forming. I used the smallest drill bit I had handy and it worked like a charm. I then build a second matching unit for the other overflow chamber. The overflow chambers were nearly silent now. Previously unheard noises now started to bother me such as water draining from the skimmer into the sump, a bit of water boiling sound from the air bubbles venting the drain lines in the sump and the whine of the return pump. Finally we could sit at the dining room table and have a conversation again. You still knew an aquarium was in the room but the beauty of it out weighted the minor inconveniences of the sounds. Each of the remaining sounds were addressed with additional tweaking except the whine of the return pump. That took a few years until quieter pumps came onto the market and I was able to get one. Were there other prototypes you experimented with before the final version? Not really. I had a handful of PVC parts to work with and within minutes 80% of it was done. By the next evening I was happy and considered it solved. There was no concept of significance or importance to what I created. It was simply just something to solve my needs. Prior to the internet becoming popular I ran a multi-line dial-up BBS (Bulletin Board System) where I talked about what I created and started to help others by making ASCII art (text based pictures) in messages trying to illustrate what I created. It wasn’t long after that the internet started to become a household “thing” and Mosaic and Netscape browsers took off, free web hosting communities were popular and I made my first attempt at a web page writing HTML by hand using Windows Notepad. The web page wasn’t pretty but it started spreading the concept. The original references to “Durso’s Standpipe” was not to the device itself but to the website I made of something just called a “standpipe”. It was short way of saying “the standpipe on Richard Durso’s web site”. It wasn’t until several years later that I officially changed the site to be “Durso Standpipes” and got a domain name to match. The experimentation came when lots of people started to attempt to make their own units. How tall does it need to be? Can I use 1.5 inch PVC instead of 1.25 inch? Why doesn’t a standpipe made from from 1.0 inch PVC with a 1 inch bulkhead work right? What happens if the bulkhead is on the back glass instead of the bottom of the tank? What happens with two standpipes in one overflow chamber? What is the relationship to air hole size and water turn over rate? What happens with a standpipe attached to an extended drain line with a remote basement sump?, etc. A period of refinement in the design height, specific parts used, how the parts were cut to adapt to smaller chambers and then add-ons such as special strainer designs emerged after working with hundreds of people. At that point I had a cookie cutter design where I only needed to know the height of your aquarium, the size of the bulkhead and if it was slip or threaded and I could do all the calculations to provide a finished product that took the guess work out of it. Once in a while somebody questions “why don’t you offer a flexible height standpipe?”. Which I ask, Do you have a flexible height aquarium? No? Then you don’t need a flexible height standpipe. It would make my standpipes about 40% more expensive to add a feature you don’t need. Instead I pass the savings on. Did you patent the Durso Overflow? If not, why? No. Initially it just wasn’t obvious the value or potential it had. Secondly, I didn’t see the value in spending thousands and thousands of dollars to get the patent for something that cost of few dollars in parts from a home improvement store. Then I would have to spend thousands and thousands more protecting the patent from every fish store and hobbyist that wanted to make their own. Would anyone know my name if I did patent it? This was my way of giving back and saying thank you to the reef keeping communities which helped me when I joined the reef keeping hobby. I wanted my design to be free to use. Free to be modified and improved. Sure, I’ll gladly sell you one if you don’t have the tools, skills or time to figure it out yourself. However, I provide the instructions on how to make your own if you choose too. That’s the important part to me. There was a brief period when a patent was being considered when I learned of a leading aquarium manufacture was intending to sell a cheap clone of my design. The fear was that they would go after myself or the aquarium communities in general trying to prevent my design from being free for the public to use. However, a patent attorney explained to me that my work is “prior-art” and “public-domain” and they can’t change that. When I reviewed their patent sure enough I was listed as prior art. I’m content with that. Any other inventions that we can attribute to you? I don’t claim the invention, perhaps had a roll just in making popular. When I started in this hobby the common use of a partitioned sump did not exist. Most people used a Rubbermaid container of some type or perhaps a small left over aquarium. The concept of the partitioned or baffled sump was designed by my father and published on my web site as a way to help deal with the air bubbles which the Durso Standpipe introduced into the sump. The partitions or baffles were used to deflect air bubbles to the sump surface and reduce the velocity of water in the sump allowing time for the air bubbles to rise and dissipate before being sucked in by the return pump and chopped into micro bubbles which made the water cloudy. My first attempts trying to make Rubbermaid containers with baffles failed when water was added due to the sides flexing outwards and detaching the baffles…. I agree, should have thought of that before hand. A later design of an acrylic tank (got dirt cheap from a LFS which scratched it, making it unsellable to them) was used on my 180 gallon tank featured multiple staggered (high and low) baffles to defect air bubbles, kept constant sump water level and even had probe holders. But probes really were not were not used yet, it was to hold kalkwasser and magnesium dosing lines and later happened to work well for holding probes. The section between the last baffle and chamber for return pump became ideal for holding extra live rocks and growing caulerpa macroalgae (later replaced with better types of algae such as chaetomorpha) and later we learned this new word for it… refugium. I also used a term “vertical-baffles” for lack of a better description at the time. These were large 4 to 6 inch diameter PVC pipe sections just tall enough to reach the sump water surface. The overflow plumbing lines drained into these. Fairly bubble free water exited out the bottom while the majority of the air bubbles stayed within reaching the surface or lightly poured over the top to the sump water level either way being contained by the baffle system in the sump. The modern counterpart of this idea would be filter socks. What should determine which overflow should be used between Durso, Bean Animal or Herbie? I’ve never had a need to try any of the other designs. However, it’s awesome that the concept and solutions available continue to improve and the authors share the ideas and let people freely use them. Giving back to the reef keeping community in whatever small way you can helping to make it a little better than how you entered it is what this is really about. To this day, I still host Ken Stockman’s original design and pictures on my web site. The Stockman Standpipe is a competing design, but it was more about sharing ideas than which design is better. This picture is of the very first Durso standpipe I made for myself. The current design which I sell / make looks a little different. The current design has the Tee/elbow assembly sitting higher to raise the water level up. The PVC is bright white with no red writing on it. The mess of reducer and bushing fittings at the bottom is now a single fitting. What is pictured shows the original male PVC adapter in the bulkhead which held the original perforated plastic pipe and sponge that came with the tank. 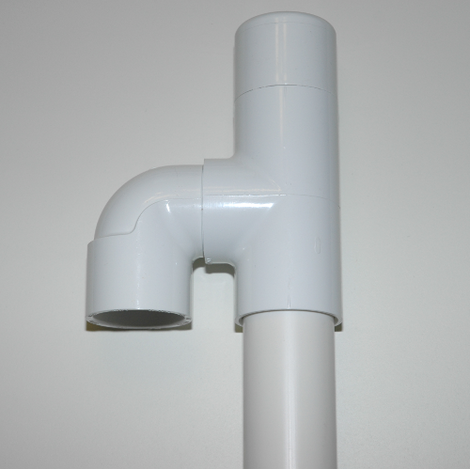 The Durso Standpipe I made was a slip connection to fit inside the exiting PVC male adapter. Nowadays the Durso Standpipe would be attached directly to the bulkhead instead. Richard is employed as an IT Consultant performing as an Infrastructure Architect for a 3 letter company on behalf of federal 3 letter agencies. He currently does not have a reef tank running as he has anticipated moving again in a few years. He is looking forward to getting a full reef tank running again. In the mean time, Richard has been playing with the idea of just a colonial anemone such as a bubble tip and clownfish tank. He’d like to just allow and encourage the anemone to split over and over again without fear of wandering into corals. READ New Year, New Aquacultured Fish Available: Captive-Bred Koran Angelfish!